A good night’s rest is paramount in ensuring work productivity the next day, as well as optimal health. It is only during sleep that our bodies repair the heart and blood vessels and other vital organs. Yet, most of us have experienced that occasional sleepless night. While many attribute insomnia to a random occurrence or something they ate wrong that day, quite often, insomnia is caused by sleeping on an unsuitable mattress. To combat that, here are the top three tips that’ll reduce your chances of getting a sleep-debt, and at the same time, ensure that you get nothing but quality sleep. Everyone has our own unique sleeping position which gets us into a deep slumber, but only a few of us take that into consideration while purchasing a new mattress. 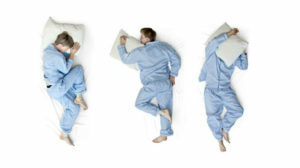 Different sleeping positions has its own set of distinct requirements and firmness level. Back sleepers require a high level of firmness and support, in order to support the spinal alignment and also to provide the right amount of push back they need. 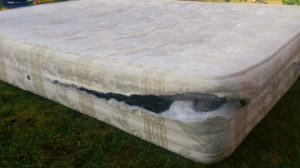 A mattress that is too soft might create pressure points on the sleeper, and eventually back problems if left unchanged. Side sleepers often change their leg positions throughout the night. Thus, they need a mattress with a soft to medium firmness level. A mattress that is soft enough will contour to the curves of the side sleeper’s body, even if the sleeping position changes all through the night. Sleeping on the stomach is the least ideal position to adopt, as the torso carries a substantial amount of pressure and weight throughout the entire night. A medium to slightly firm support is therefore needed to keep your back from arching and to avoid any extreme spinal misalignment and discomfort. Nobody likes spending frivolous money, so if your current mattress is less than eight years old, it might not warrant a change of mattress. The eight-year rule applies, unless you face difficulties sleeping on your mattress, feel restless despite a night of rest, wake up with body aches – then this is a physical sign that you might need to consider purchasing a new mattress. There are a variety of mattresses available in the market, and this might make it hard to choose the ideal mattress based on your personal preference. However, the consensus is that latex mattresses is the safest bet to stick to. Being a botanical product that is made from the sap of a rubber tree, pure latex is inherently hypoallergenic, antimicrobial and dust-mite free. There is also no risk of it harbouring potential bacteria or other microbes, for its botanical properties and natural latex foam does not provide a conducive environment for parasites. Additionally, and perhaps the most crucial factor in encouraging quality sleep, is that latex adapts perfectly to the contours of a sleeper’s body curvature as you sleep. This provides the optimal support and comfort, personalised to different spine alignments, easing tension on any pressure points and promoting a night of good sleep. Your mattress is the fundamental key to quality sleep. Take charge of your health now, starting with a good night’s sleep, which will ensure a day of productivity, good mood and a healthier appetite. WHICH MATTRESS MODEL SUITS YOU? Our TRILOGY mattress offers an epic experience. 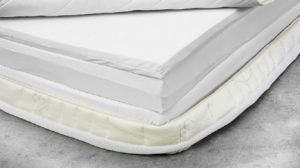 As the name implies, TRILOGY is actually assembled from 3 latex mattress cores with variable firmness ratings. For unexpected guests or sleepovers, each latex core can also be separated through the washable Bamboo Zip Cover, forming 3 individual mattresses. Arguably our bestseller, GRAND offers a firm yet enveloping effect. GRAND includes a deep layer of soft latex for that extra plush feel that relieves tension and relaxes your muscles. Comprising of 2 layers, simply by positioning the soft topper at the bottom or top of the mattress, you can moderately increase or decrease firmness. CHIRO has an extra firm base latex core with a plush micro perforated topper on it, giving you unequalled back support and pure pleasure as you lay down and the perfect comfort as you drift into sleep.